Note: Please note that the following information is mostly outdated and no longer relevant in mythtv 0.23 and later. 6.1 I get no sound from MythTV when watching TV but MythMusic and command-line test all work fine. What is the problem? 6.2 How do I set up Myth plugins to use digital sound with mplayer? 6.3 How do I do this with a PVR-350? 6.4 How do I do this in KnoppMyth? 6.5 How do I do this in Fedora Core? 6.6 How do I get my mac mini SPDIF out working? 6.7 How do I get 5.1 AC3 audio to work again? MythTV relies on the operating system sound system to provide audio. You should make sure first and foremost that you have a working sound system outside of MythTV before thinking there is something wrong with the software. Check the appropriate support site or Linux documentation in addition to any hints here in getting your sound card working under Linux. The MythTV wiki Sound card page also contains useful information on this topic. If you have additional information, please add it to the External Links page. The default in modern Linux systems that use the 2.6 kernel is now ALSA. 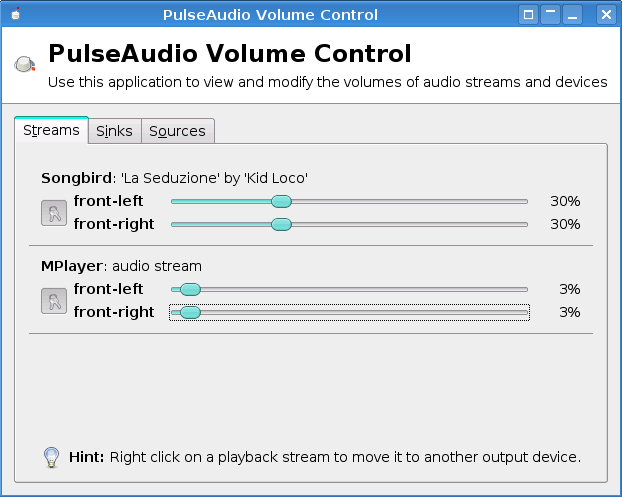 For MythTV installations it is advisable to turn off any sound servers that sit on top of ALSA such as Pulse Audio or the KDE or Gnome sound servers. 1. We want to have the audio decoding done outside of the computer for greater sound quality. 2. We want to play DVD with full surround sound using DTS or Dolby Digital. You need to be aware that ALSA by default will upsample all of your audio to 48 kHz. This keeps it compatible with TV broadcasts as well as Dolby Digital and DTS surround on DVDs. ALSA typically takes the sound from your content, routes it through a module called "plug" where this resampling takes place, and then routes it to a module called "dmix", a software mixer, before it outputs it to your SPDIF/iec958 connector. For Die hard Audiophiles, this resampling is a real source of irritation as CD audio is made using PCM at 44.1 kHz. The upsampling in ALSA is unfortunately very low quality, and if you have a half decent amplifier and speakers, you will notice that CD playback has a congested compressed sound to it. This is very easy to overcome, by sending all your audio directly to your soundcards SPDIF or IEC958 Connector. The device name for this connector is typically "cards.pcm.iec958". So just configure this device as the audio device in MythTV. Don't forget to unmute your iec958 output using alsamixer. Now when you play a CD your amp should show PCM output at 44.1 kHz, and TV broadcasts as PCM at 48 kHz, and your DVDs will also have full blown surround. Don't forget to rip your CDs using Lossless FLAC as the encoder (this is the default for the "Perfect" setting in the MythTV) will preserve the 44.1 kHz audio files from your CDs. An option was added in version 0.22 (thread): if you're confident that ALSA isn't going to resample (twice) and have appropriate hardware, you can add a setting 'DisableResampler' with value 1 to the database. Otherwise the modern ALSA does software mixing by default and resamples to 48k before sending data to the card. For the vast majority it's far better that we resample - SRC anywhere else in the chain (ALSA, card) would be done with a SNR much less than a *worst case* 97 dB..
Several Linux distros (Ubuntu, Fedora) now use PulseAudio per default. and last but not least network transparency, i.e. sound output on different computer is possible. High latency, sound samples can take anywhere from half a second to 2 seconds longer to reach the sound card. Whilst this is faster than other sound servers it is unacceptably slow compared to direct interaction with alsa and can cause significant problems with video playback. 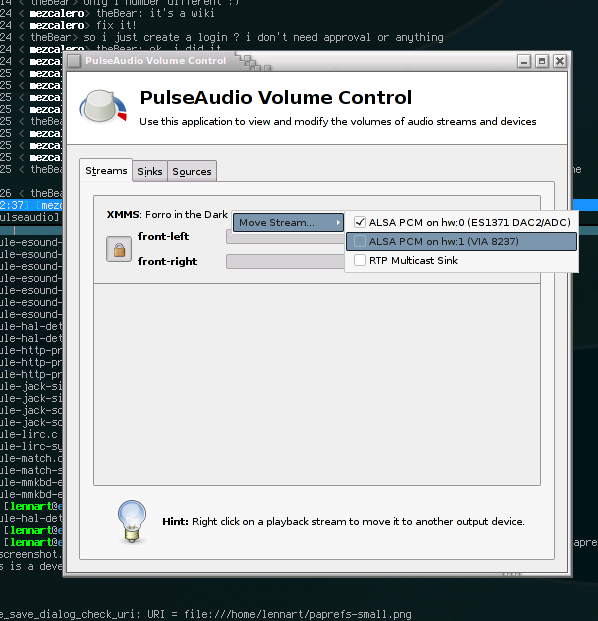 See also PulseAudio's website on how to setup your computer and applications for PulseAudio. Some receivers/sound devices may not properly play LPCM audio until this test is executed. Essentially it sets some state somewhere that allows LPCM to be passed to the receiver. At least this was the case on my receiver, an STR-DA3300ES Sony. Bitstreams worked fine, but LPCM would not work until I ran these speaker tests. There is probably more going on here but it won't hurt to run this test to initialize some state to make sure everything works. Don't forget that there are some utilities that are included in the alsa-utils package. Use your favorite package manager to install the package. This is especially true for alsaconf recommended in the installation guide. text based mixer. Fills screen with all available audio inputs. push the slider up to increase volume. The word CAPTUR above a column means it's being used as an input. Use space to select. Note that selecting some inputs automatically deselects others. I get no sound from MythTV when watching TV but MythMusic and command-line test all work fine. What is the problem? How do I set up Myth plugins to use digital sound with mplayer? Add the following to your mplayer lines in the setting dialog, substituting the device alias you wish to use. This will tell mplayer to send output audio to the digital device. It will pass ac3 or dts directly to hardware digital out. This allows you to watch dvds and videos with digital sound correctly, while still being able to watch those with mp3 audio without having to edit the command line. Note the leading comma, this allow mplayer to fall back on audio codecs, from AC3, to DTS (if the file is DTS the mplayer lines at the beginning of this section will not work) if it is neither then the leading comma means it will fall back to default and play regularly (as in an mp3 avi file). How do I do this with a PVR-350? The PVR-350 encodes the TV signal it receives from its built-in tuner or from its various audio and video inputs into MPEG-2 format and streams that output to MythTV which writes that stream into files. When MythTV plays back those MPEG-2 files or those generated by other PVR-x50 and similar cards, it simply streams them them back to the PVR-350 and the PVR-350 decodes the audio and video and sends them out of its cables. To get the audio produced by the PVR-350 many people take its audio outputs and use a cable to pipe them back into their sound card's Line In jack. If you're using the Line Out jack on your sound card to send analog audio to your amplifier, then all you need to do is unmute the Line In control in your audio mixer and set the volume. However, redirecting this output to the S/PDIF output in digital format requires a few more steps. Note: The names of the sound card controls used in the following command examples will vary depending on the audio device installed in your computer and the driver module it uses. The command “amixer” entered without any options will output all of the controls exposed for your audio device and “alsamixer” or your favorite graphical mixer program can also be used to manipulate these controls to make these settings. If you like, you can set up a button on your remote to toggle this setting. The “&” at the end of the line causes this command to run in background so that the script can continue executing the rest of the commands that it contains. Note that this approach may not produce the best possible sound quality. Ths sound is going out of the PVR-350, back into the soundcard, being sampled by “arecord” and “aplay” and then sent out the S/PDIF to be converted back to analog by your apmlifier. If you have an optical interconnect between your MythTV frontend and your amplifier it may help reduce ground-loop hum though. On the other hand, this technique may introduce a time lag that causes your audio to be out of sync with the video when you watch TV. How do I do this in KnoppMyth? How do I do this in Fedora Core? How do I get my mac mini SPDIF out working? I also found that sometimes the SPDIF goes into a funky state and a reboot is the only thing that gets it out of this state. So if you think everything is right, but the sound just isn't working, try rebooting again. How do I get 5.1 AC3 audio to work again?